Men are often unaware that estrogen (estradiol) plays a critical role in their day-to-day health. Estrogen is found in small-but-critical concentrations in men. It needs to be in balance with the rest of your hormones, especially testosterone, for you to feel well. Estrogen levels and testosterone levels are closely related. In fact, one of the primary causes of low estrogen is actually low testosterone. Men’s bodies produce estradiol, a form of estrogen, as a byproduct the breakdown of testosterone through an enzyme called aromatase. Aromatase is found in estrogen-producing tissue, such as the adrenal glands, the brain, fatty tissue, and even the testicles. Estradiol is often referred to as E2 and is one hormone in a class of hormones called “Estrogens.” This class includes estradiol, estriol, and estrone, among others. Estradiol is likely the main estrogen you need to worry about. Since the necessary level of estradiol that men require is derived from testosterone, a correlation develops. If your testosterone is low, your body doesn’t have the raw materials needed create more estradiol. If you have low testosterone, you may have low estrogen (estradiol) too, probably leading to the symptoms of hormone imbalance. That’s why low testosterone symptoms and low estrogen symptoms often look so similar: they’re occurring at the same time, and it’s hard to determine what’s causing what. Normal total estradiol levels in men are somewhere between 20–55 pg/mL (2.0–5.5 ng/dL) and 10-40 pg/mL (1.0-4.0 ng/dL), depending on whom you ask. The first range is based on a study of the total estradiol levels of 115 healthy men. The same study with the same group of men found that free estradiol levels ranged between 0.3–1.3 pg/mL (0.03–0.13 ng/dL). Keep in mind that these “normal ranges” aren’t exactly agreed upon throughout the medical community. The truth is, human bodies vary so much that no one can really say for sure, and testing methods have changed over the years, leading to some discrepancy. Numbers don’t tell the whole story. If you’re experiencing the symptoms of low estradiol, but your numbers don’t match up, you may still be a candidate for hormone replacement therapy. Just like testosterone and other hormones, a level is only “low” if you’re experiencing symptoms. Similarly, there are men who fall outside the range who nevertheless are asymptomatic. It all depends on you and your body. If you’re experiencing symptoms, you’ll want to get a blood test to see precisely what’s going on. It’s possible your levels won’t fall outside the normal range, which may indicate something else is causing your symptoms. Most of these, especially the symptoms related to how you feel on a daily basis, could appear on a list of either low testosterone or low estrogen symptoms. These are simply symptoms of overall hormone imbalance. To summarize, you can have low testosterone by itself, or low estrogen by itself, but often, they go hand in hand. The symptoms are very similar, which means that it’s almost impossible to determine which hormone is insufficient without proper blood testing. 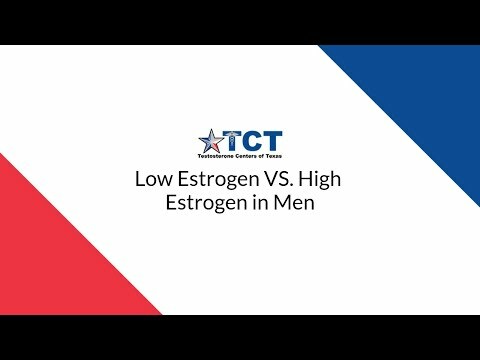 If you were to experience low estrogen along with low testosterone, in addition to prescribing testosterone treatment, we might also prescribe some form of estrogen, usually in the form of a gel or a cream. Unlike testosterone, we want estrogen to be bioidentical to ensure it works properly. For men, it is rare to find low estrogen levels unless that person is undergoing some kind of treatment to reduce estradiol directly. In the setting of Testosterone Replacement Therapy (TRT), we are much more likely to deal with increased estradiol levels, called hyperestrogenism. There are many reasons why your body may be producing too much estrogen. For instance, if you suffer from obesity, your excess fat can actually start producing additional estrogen beyond what your body already produces. In these cases, much of the extra testosterone being introduced into your body can be converted into excess estradiol. As we begin to raise one level through hormonal replacement therapy, it’s really important to carefully monitor the therapy’s effect on your other hormones. That’s why frequent screening is part of our therapy process at Testosterone Centers of Texas. Most often, a medication named Arimidex (anastrazole), an estrogen blocker, is the treatment of choice to help reduce and control estradiol levels. This medication, when used and monitored appropriately, is safe, inexpensive, and very effective. Once-per-week dosing is typically enough to reduce elevated levels back into the normal range. Special care should be taken to monitor for side effects of persistent estradiol elevation and flushing, which may occur with the use of Arimidex. Because both male and female bodies naturally contain both testosterone and estrogen, just in different amounts, your body tolerates the “opposite” hormone rather well. If you don’t tolerate the hormone well for any reason, we can easily reduce it. Because we don’t implant or use hormone pellets (which can last up to six months) and instead use injections for testosterone and topicals for estrogen (which last no more than a week for each dose), we can easily titrate the dose to one your body tolerates more effectively. Your body will react quickly to these adjustments, often in a matter of weeks or a handful of months. When you come into our clinic feeling like you have low testosterone, we check all your hormones. Estrogen levels must be evaluated and managed the right way for Low T treatments to be safe. Ensure that anyone who treats you for low testosterone understands and explains all the known risks associated with therapy. Being aware of potential issues and having a plan of action that prevents them from becoming problems during therapy will keep you both happy and healthy. The staff at Testosterone Centers of Texas (TCT) look forward to helping you improve your quality of life.